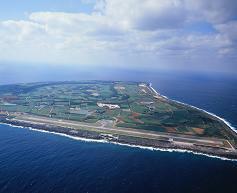 Kita Daito Airport was built for the purpose of emergency landings in April 1971. Construction was funded by USCAR (United States Civil Administration of the Ryukyu Island’s Aid). The coral paved runway was converted to an 800m-long asphalt emulsion runway in June 1978. DHC-6 aircraft operated between Naha and Kita Daito, although they were frequently cancelled due to frequent bad weather and wind conditions. The airport was consequently upgraded to accommodate larger flights in October 1997.